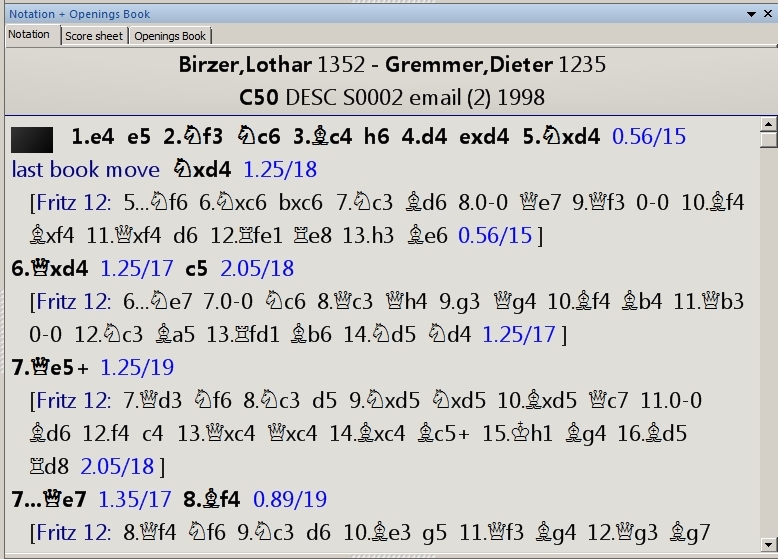 Last time around we learned how to analyze a chess game using the “Full analysis” mode in Fritz and its related playing programs (Rybka, Hiarcs, Junior, & Shredder). “Full analysis” is a decent tool for chessplayers (especially beginners) who don’t want to be overwhelmed by long, and sometimes complex, variations and who would rather have verbal cues and symbolic notation instead of numeric evaluations. But for players who are a bit more advanced and aren’t afraid of numbers, there’s another analysis mode available. “Blundercheck” provides precise numerical evaluations – you’ll not only see that the chess engine’s suggested variation is better than what was actually played, you’ll see exactly how much better. It would be pointless for me to repeat the descriptions of the “Side to analyze”, “Threshold”, and “Storage” settings – these are all described in the immediately previous post to this blog. However, this dialogue does contain some new settings we’ve not seen before. First of all, I should point out that the “Time” and “Depth” settings are mutually exclusive: you can set one or the other, but not both. As always, I recommend the use of “Time” instead of “Depth”; this allows Fritz to budget its own time and, in lively positions with forced tactics, you will likely get a deeper search by using “Time” (the tradeoff being that you might get a shallower search in closed positions). However, if you’re going to use “Depth” please set it for an odd number, as some chess engines become tactically “blind” at even numbered search depths, failing to consider proper replies to a tactical shot which happens at the end of its search. “Output” determines whether the engine’s output will appear as a text annotation (and by text, I still mean algebraic notation move sequences, not text explanations of moves and variations) or as replayable variations (in which you can replay the suggested variation directly on the screen). I recommend “Annotate as variations” so that you can play them out on the screen as you’re reviewing the game. As in “Full analysis” mode, the “Erase old variations” command wipes out any existing commentary in a game (such as a GM-commented game from Mega Database), so please use this toggle with caution. Selecting “Write full variations” means that the engine will include the entire recommended variation it finds, while unchecking it will cause the software to truncate the variations, shortening them to just a few moves (as we’ve previously seen in the output of “Full analysis”). A check in the box beside “Training” means that the software will generate an occasional timed training question if a major tactical blunder occurred in the game being analyzed (this, too, was discussed in the immediately preceding blog post). “Check main line” means that the chess engine will evaluate the moves of the actual game. “Check variations” means that the chess engine will perform its analysis only on existing variations in the gamescore. 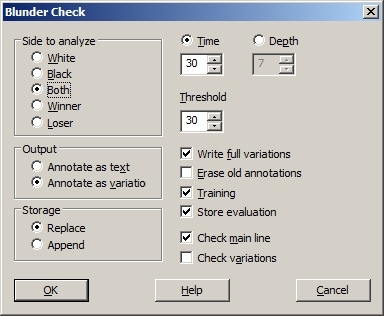 This latter function is, in fact, the original intended purpose of the “Blundercheck” feature. Say, for example, you’re annotating a game for publication and have included several variations in your notes. If you select only “Check variations”, the chess engine would ignore the move actually played in the game and analyze just the variations you added. This is a really handy way for chess writers to double-check their own evaluations prior to publication. The combination of these two features provides you with a lot of flexibility for having a chessplaying program analyze a game. You can start with an annotated game (one you’ve annotated yourself, for example, as a means of practicing game analysis) and have your chess engine analyze only the main moves of the game, only your added notes, or analyze all of it (but do remember to turn off “Erase old variations” first!). Each move of the game has a numerical evaluation in blue, expressed as two numbers. The first tells you who is ahead in that position and by how much (expressed in pawn units). For example, after 6.Qxd4 White is ahead by 1.25 pawns; even though the material is even, White has developed two pieces to Black’s none, and Fritz thinks this is the positional equivalent of being ahead by a pawn and a quarter. Please note here that a value expressed as a negative number means that Black is ahead in the position. The second number (after the slash) is the search depth: how far ahead the software looked to make that evaluation. For example, after 6.Qxd4 Fritz thinks White is ahead by 1.25 pawns and searched 17 plies (8.5 full moves) ahead. Here Fritz has found an improvement for White’s seventh move. In the actual game, White played 7.Qe5+, which results in a position which Fritz evaluates as being 1.25 pawns better for White. But had White played 7.Qd3 instead, and had the remaining moves of the variation through 16…Rd8 been played (with each move of this variation being the best move for either player in Fritz’s estimation), the result would have been a position in which White would have been 2.05 pawns ahead – an improvement of 8/10ths of a pawn (which, by the way, rates as a significant improvement). In what way can it be looking for a great move? This option is for the wrong moves, but nowhere does it show that it played a great move. I have no idea what you’re asking here. You set a value for “Threshold”; if the engine finds a line of play which results in an improvement higher than the Threshold value, it displays that line of play. It also provides a numerical evaluation of that line of play, along with one for move actually played so that you can compare the values. If you set a low Threshold of, say, “25”, any move which doesn’t get a computer-generated variation was evaluated as being within 0.25 pawns of the best line of play — in other words, close enough to the “threshold” that any improvement isn’t much of one. So any move in which Fritz doesn’t show an improvement can be considered a good move.